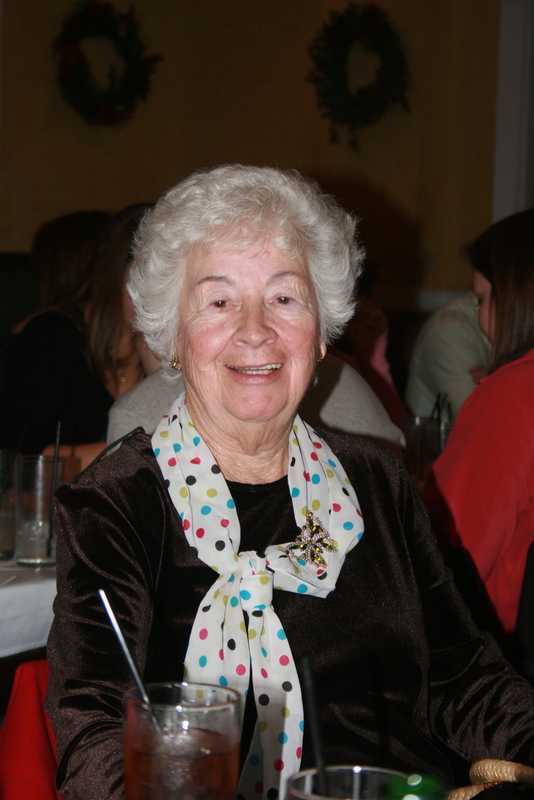 There’s no manual to life, but I am lucky enough to have the next best thing: my grandma. You’d be wrong in picturing my grandma as a sweet, cookie-baking woman. My grandma, petite with black eyes and (now) cotton-colored hair taught me to play poker and shoot dice when I was just eight. She has fought off muggings with her booming voice. She’s lived in Chicago her entire life, was born the year the stockmarket crashed and was raised in the “back of the yards” as they say there, referring to the neighborhood behind the stockyards. She is sharp, witty, and sage. I don’t take advice well, but hers is always welcome. Scarves instantly make an outfit better. Just another lesson. This is something she said to me recently, when I told her about my new gig as a contract copywriter for a major cellphone company (yay! to jobs). “If you don’t like it, just convince yourself you like it.” My grandma has taught me this again and again. If we didn’t want to eat something, she’d scoop it up in her fork and talk about how great it was until she had us almost convinced she was eating Skittles instead of canned green beans. When she talks about her own childhood, it’s never negative, never whiny, although I am positive she’s been through some of the hardest times the country has ever seen. She prefers to reminisce about how the entire family would push the tables aside on Thanksgiving and dance the jitterbug. Why am I not dancing the jitterbug right now? Oh, because I am on the internet. She told me when they got dessert in her house, they’d flip the plates over at dinner. Their mom would plop down a piece of bread and pour canned milk over it along with a sprinkle of cinnamon. Lesson learned: The ability to think positive is an essential accessory in every expat’s suitcase. In Quebec, during its formidable winter, I convinced myself I liked wearing two scarves, five-pound boots, and walking a mile in the snow. As soon as my attitude changed, I found myself enjoying winter — even scraping ice and snow off the car, the Canadian version of P90X. I silently point out all the amazing things in my life, not just The Husband and Genius Dog, but things in nature: reflections in still puddles, trees lightly tapping the window, the moment after it rains and everything is silent. These are all free and open to anyone. Bonus lesson: Jitterbug your way through hardtimes. 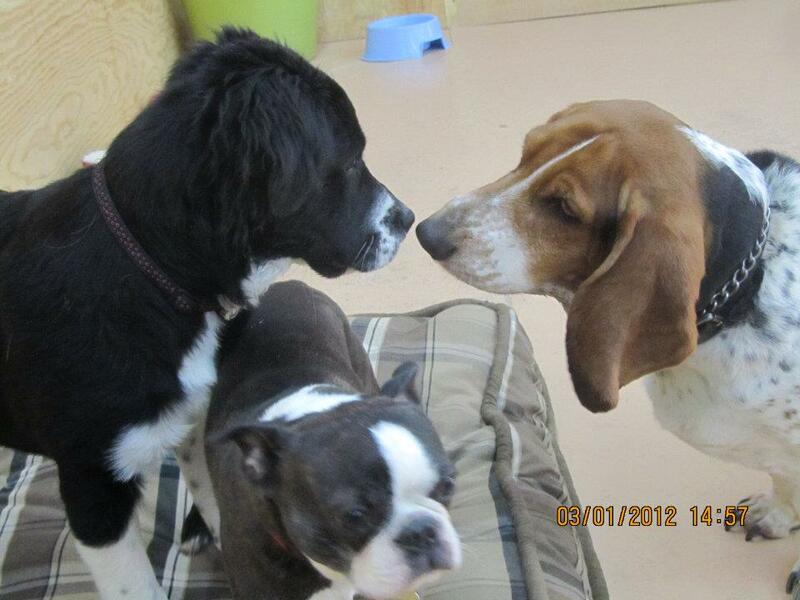 That’s my dog, busy thinking of his next move while the two other dogs chat needlessly. I am more of a lone wolf than leader or follower. But when I was 10 and wanted to fit in with known mean girls Erin and Janna, I was a follower. On our first day of school one year, Erin and Janna didn’t know what bus stop to stand at, so they kept running from bus stop to bus stop (two streets apart), likely whispering about me as they did so. I lingered behind, following them from street-to-street, although I knew if we waited at one of them, the bus driver would spot us and stop. My grandma, sensing girl-on-girl cruelty rolled up in her big, black chevy. I dunno, I answered. My face flushed with embarrassment. The girls were no longer running from corner to corner, they were staring at us and giggling. “They can hear you…” I tried to shush her. She got louder. She continued on, but the humiliation stopped me from listening to the rest of the lecture. Lesson learned: I no longer care what others have or want, I move with my own internal compass. If I followed Erin and Janna, I could still be looking for the bus. And if their Facebook updates are any indication, I would also have terrible grammar. 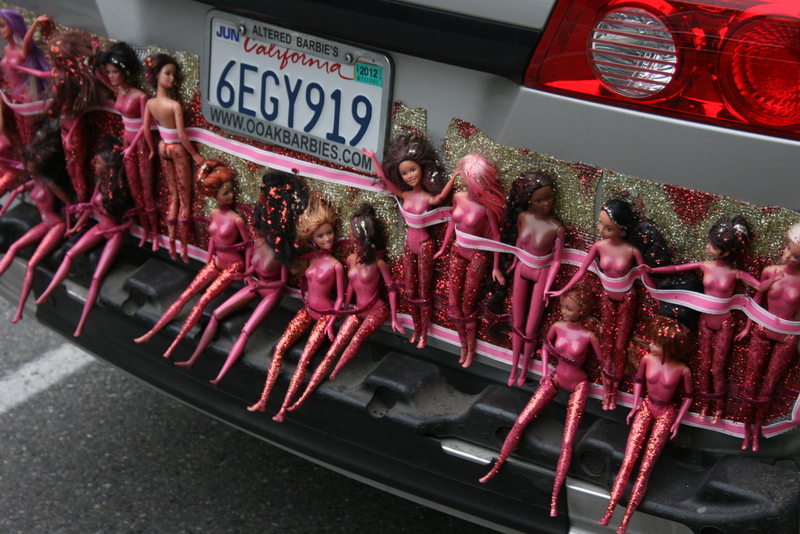 Barbies living on the back of a car. And they still sparkle. As street-savvy and thrifty as she is, my grandma is a giver. She has lingering Depression-era habits, like filling purses full of ketchup packets and stowing away a sock full of cash. She brought me to food banks and thrift stores, showing me how to find the best deals and giving me advice, like never buy underwear second hand. But she didn’t just teach me how to save by combing through piles and piles of novelty tee shirts and dated jeans. She taught me how to give in an honest, straightforward way. We went to her house every day in the summer. She lived in a brick bungalow, one she would eventually move out of when violent gangs infested the area. On the corner, there was a lady, covered in blankets, wrinkled and red, all of her worldly possessions in shopping bags that hung from her wrists like ornaments. “Isn’t that terrible?” Grandma asked me and my five siblings. We nodded. None of us admitted that we were frightened. I thought for certain that she was a witch and would pull a shrunken head out of one of the bags. “You’re going to give her a dollar.” She gave me a dollar and instructed me to hand it over. My hand vibrated like a plucked guitar string as I passed it over. My grandma introduced us all and then we moved on, the woman saying “god bless you,” as we continued walking. Lesson learned: The interaction taught me that human suffering is scary and ugly, but it’s there. Acknowledge that it’s there and acknowledge people and if you have a dollar to spare, spare it. But don’t get scammed or put yourself in an unsafe situation. p.s. I wish the East Coast good thoughts with Hurricane Sandy. Categories: Facts of Life | Tags: barbie, Charity shop, Chicago, Great Depression, shitmydadsays | Permalink.